When I was younger, I LOVED peanut butter and jelly sandwiches. I don’t know that I ate any sandwich or meal as much as I ate peanut butter and jelly sandwiches. I think that it was a pretty big staple amongst my group of friends, too. As I grew up though, I found myself eating them less and less despite the fact that I still loved the taste. These easy sandwiches are saved busy days when we don’t have much time to cook orroad-trips where it’s a quick meal to put together in the car. Peanut Butter and Jelly Sandwich Cookies. The first time I had these, I was at a food day and I specifically remember saving one for Nathan as he still loves peanut butter and jelly sandwiches. One bite from each of us and we knew that these would become a staple in our household from that day forward. These are super easy, but they look like they take a lot of time so if you’re looking to score points for presentation, make these. 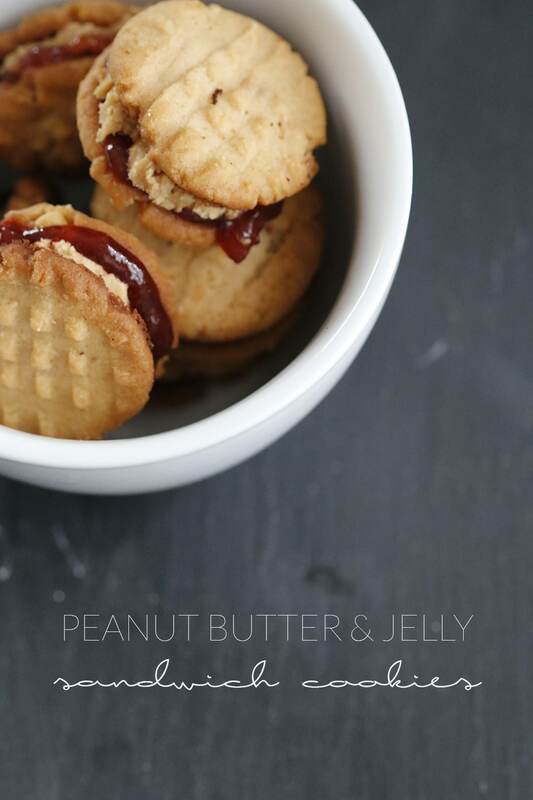 They’re perfect for picnics, family reunions, birthday parties or well, any occasion if you love peanut butter as much as I do. And they are great for the entire family. Both kids and adults love these little sandwich cookies! A deliciously sweet new take on the peanut butter and jelly sandwich. Preheat oven to 375 degrees and grease a couple of baking sheets. In a large bowl (I used our Kitchen Aid), combine the sugar and butter. Mix in the egg and vanilla until thoroughly mixed. Mix in the peanut butter until smooth. Stir in flour, baking soda, baking powder and salt until well combined. Roll the dough into tsp sized balls and place on baking sheet. Flatten with a fork. Combine the peanut butter, powdered sugar and butter until thoroughly mixed and smooth. Spread the peanut butter filling (enough to cover the cookie) on one cookie and the jelly on another. Press together to form the cookie sandwich. This recipe yields approximately 50 sandwiches, or 100 cookies, at tsp sized balls. Double the size for fewer cookies/sandwiches. These are super addicting which is why I make them so small. They’re almost bite-size which means when I decide I need a little snack 3, 4, or 5 times a day – I don’t feel as guilty about eating these ;) Just double the size of the cookie balls if you want bigger sandwich cookies and have more self-control than I do! OMG yum! Hubby’s reduce our sugar intake is killing me and so are these yummy sweet recipes! Mine too! :) Thanks, Miranda! oh wow these look absolutely delicious, these are definitely my bread and butter whenever I have some time. These look amazing! I love PB&Js so I’ll have to try this! Thanks for sharing! What?! This is so genius! The pictures are fantastic. These look absolutely delicious and I would eat all of them! OH my gosh, YUM! These look amazing! i LOVED these cookies growing up too!! I’ve never thought to make them myself but I really want to do this soon now. Thanks for the recipe! Oh mylanta! I want these right now, so so yummy! I’ve been loving PB&J lately in all forms! I’ll have to try these! These might be the most delicious looking cookies I’ve ever seen! Oh man, these look lik everything that is delicious in the world! I can’t wait ot try them out! I’ve never heard of these cookies, and I can’t wait to try them! Hope to be able to this weekend. These are seriously darling! Not only is peanut butter and jelly a nostalgic trigger for me, but I remember when I was a child, I got to press the tines of the fork in the peanut butter cookies! Thanks so much for sharing this with us at Throwback Thursday! PB&J’s are the best! Thanks for sharing with us at #FoodieFriDIY – hope to see you again this week!